The film version of Hibana (Spark) is coming out after Netflix Japan did a 10-part TV series from the same source material last year. Both are based on the Akutagawa Prize-winning novel by Naoki Matayoshi, which sold over 3 million copies. Matayoshi is also a famous comedian and this experience was crucial for him to write Hibana as it is set in the Japanese comedic world of manzai (a form of traditional Japanese stand-up comedy). 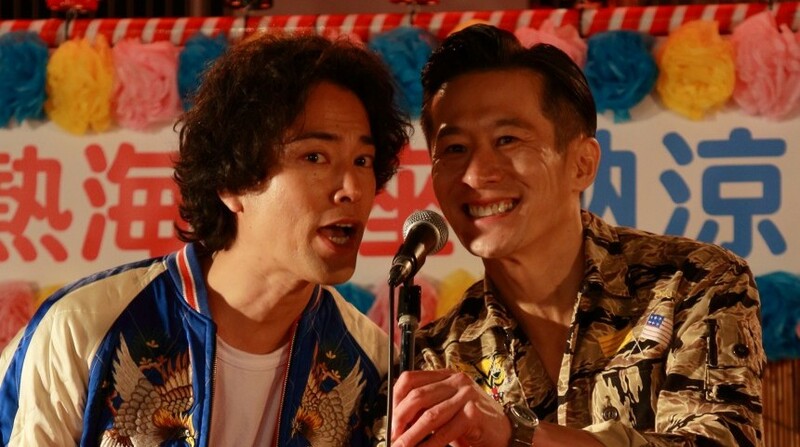 The plot revolves around Tokunaga (Masaki Suda), an up-and-coming manzai comic who meets the older, cutting-edge performer Kamiya (Kenta Kiritani). He immediately pledges to be his deshi (apprentice). The film follows their relationship for 10 years, outlining their heartaches and battles as minor comedians in Japan as well as the challenges of friendship. Tokunaga is so taken with Kamiya because the older comic performs, and lives his life, in an outrageous and unconventional fashion. On stage he’s always trying to get a chuckle with the unexpected, taboo, or controversial joke. Not content to simply make people laugh, Kamiya wants to push Japanese comedy in new directions, and challenge people’s expectations of comedy. This is a fine attitude for an avant-garde artist, but not such a great one for a performer trying to make it in Japan’s mainstream media. In addition, Kamiya’s personal life is something of a mess. Since he can’t pay rent, he crashes at the apartment of a woman who would like to be more than just friends, but Kamiya is expert at keeping everyone at arm’s length. The piece works on many levels. It accurately portrays a person who has high artistic goals but low personal ethics, also showing the tough road of Japanese b-grade entertainers. But more than that, it incisively depicts the relationship between two friends, who on the surface share a teacher-student bond. But below the surface we can see it is Tokunaga who helps and takes care of the reckless Kamiya, assuming the more mature role. In addition, the piece sketches the melancholic passing of time and loss of a dream. Vibrantly presenting humor and the drama of friendship, the work is also tinged with sadness and a certain poetic understanding of life.